Overview: Making his way from coast to coast is Godzilla, King of the Monsters. Breaking free from an iceberg, Godzilla comes to shore in California. Battling the Champions of Los Angeles, Godzilla makes quick work of the heroes and starts a cross country trek. Following in the wake of the monster is the Godzilla Squad, a team organized by S.H.I.E.L.D. to capture and contain the monster. Dum Dum Dugan and Gabe Jones represent S.H.I.E.L.D., who want to put the monster down; and Rob Takiguchi and Tamara Haskioka are working to preserve the monster. Along the way to New York City, Godzilla encounters a batch of Pym Particles which reduces the monster down to eight inches in height. However, the particles slowly start to wear off in the Museum of Natural History, as the Fantastic Four try to stop him. Reed Richards has the idea to use Dr. Doom’s time machine to send Godzilla back in time, where he ends up battling the Devil Dinosaur. Eventually, Godzilla returns to the present time and faces off against the Avengers in a final battle. Godzilla finally trudges off into the Atlantic Ocean as the series ends. What makes this Essential? : To me, a volume like this is very Essential. The reader gets the complete series in one volume. The creative team remained the same across the entire run of the series, which strengthened the storyline. In this corporate age of comics that we find ourselves in, it’s highly unlikely that Marvel will ever own the rights to publish a Godzilla comic again, much less include it in the actual Marvel Universe. With all of the various cameos of Marvel characters, this is a fun volume. Track it down if you do not already own it. Footnotes: For a period of time in the late 1970s, Marvel had rights to both Godzilla and Shogun Warriors, both Toho properties. During this time, Moench and Trimpe created the Red Ronin, a Shogun Warrior-type mecha that has remained part of the Marvel Universe despite the loss of the two properties. If you like this volume, try: the new Godzilla movie that is opening this weekend. It looks really good, and I can’t wait to see it. Or go find some of the classic Godzilla movies to watch. Some movies are better than others, much like some comics are better than others. There is bound to be a Godzilla movie that suits you best. This entry was posted in Godzilla, Marvel Essentials and tagged Doug Moench, Godzilla, Herb Trimpe, Jim Mooney, Tom Sutton. Bookmark the permalink. This was one of my favorite series as a kid and I was disappointed when it came to an end. It was definitely fun to see Marvel Heroes interact with the King of all Monsters and I am glad they were able to reprint it- even in black and white. 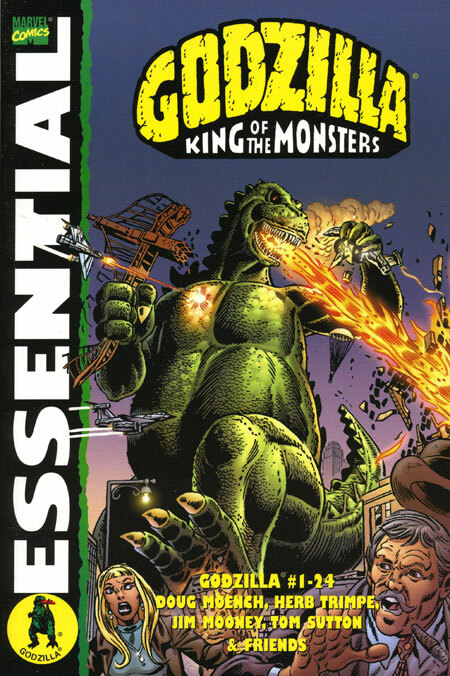 Pingback: Throwback Thursday – Essential Godzilla Vol. 1 – WORST. COMIC. PODCAST. EVER!